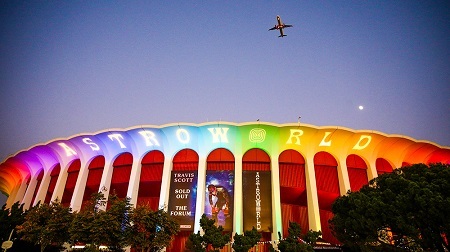 Rapper Travis Scott is now amongst the many musicians who have had repeat sellouts at the venue The Forum, California having grossed over $1.7 million in one night. According to sources, Travis Scott joined a major company following his Astroworld concert on February 8 at The Forum where he bagged $1.7 million in one night. The Astroworld concert sold over 16,300 tickets at the forum, which adds up to earnings of $2 million in one show. This is a huge achievement for the rapper, as he is one of the few artists who has had repeat sell-out concerts at The Forum in about 12 months period. Travis Scott now joins musical legends like Michael Jackson, Lady Gaga, Sting, Janet Jackson and Garth Brooks to have sold out performances since 1990. Prior to this Travis also had sold out concerts in December 2018. He previously canceled a show in February when wife Kylie Jenner accused him of cheating. Now that he's back on the road, Scott has now 10 more concerts left on his tour.